***I am so thankful to be a part of this blog circle "Letters to our Sons" with so many amazing photographers and moms. In honor of our love for our little boys, we are posting a monthly image(s) along with a corresponding, heartfelt letter. After reading my post, please click HERE to continue around the circle, starting with the ultra talented Jill Cassara. This past Sunday was 75 degrees, sunny and without a cloud in the bright, blue sky. 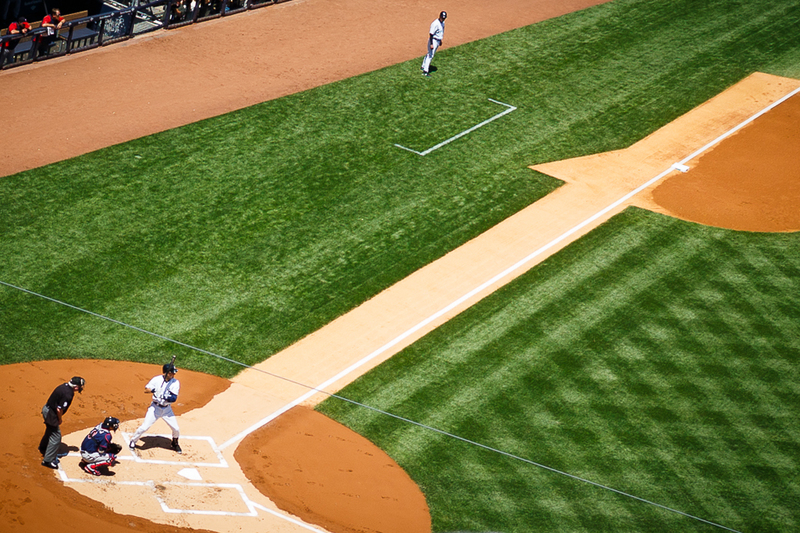 It was the perfect day to take you to your first baseball game at Yankee Stadium. 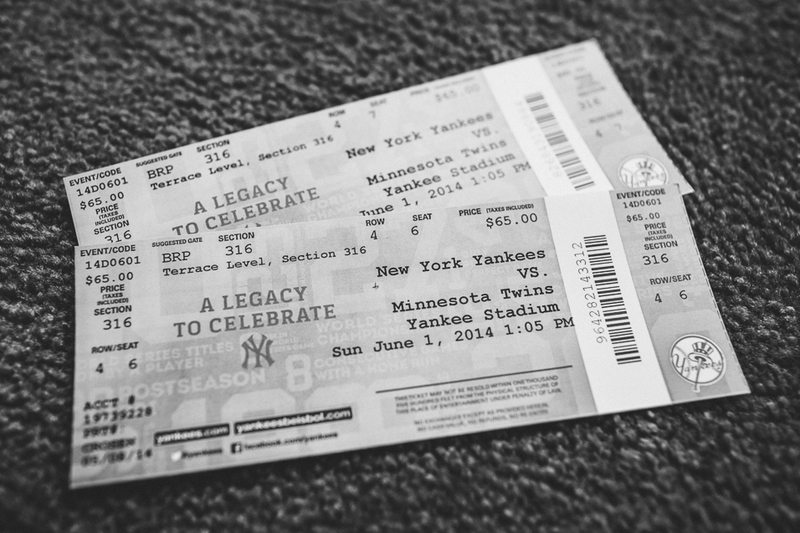 I surprised you and Dad with tickets to the 1:00 game against the Minnesota Twins for Father's Day and I'm not sure who was more excited. Since Derek Jeter, one of the greatest MLB shortstops and Yankees heroes of all time is retiring after this season, Dad wanted to make sure you were both properly outfitted and ordered two matching #2 final season commemorative logo t-shirts, one big and one small. The morning of the game the first thing you did was put on your Yankees hat (you were already wearing your t-shirt since you wanted to sleep in it the night before) and run around the apartment saying, "I'm going to my first Yankees game today!" "Can I hold my own ticket Mom?" "Can I bring my baseball glove?" "You should bring your binoculars?" I said back. Even though we live close enough to the stadium that we could have walked there if we wanted, we rode the D train two quick stops to 161st Street. You were thrilled (as usual) to be taking the subway and even more so to be heading uptown for a change to the Boogie Down Bronx! When we got to our seats in section 316 of the terrace and to the right of home plate, the baseball diamond was being groomed and players were in the outfield stretching and warming up. You and I had fun watching all of this while Dad went to wait in the (long) line for cheeseburgers, french fries and soda. No doubt we had to have some good 'ole stadium grub. That's the whole fun of it. Your binoculars came in handy, especially when Derek Jeter was up to bat. And when you weren't using them, Dad had fun teaching you the ins and outs of the game. You were so excited every time there was a strike against a Minnesota player and cheered wildly with the crowd whenever a Yankee got a hit. But in all honesty there came a point where all you cared about was getting some ice cream in a Yankees batting helmet bowl. Dad disappeared to get the goods, and that's when the game's biggest action happened. First, Derek Jeter had a huge hit into the outfield, making it all the way to second base. Then the next two batters helped bring in the Yankees only two runs of the game and the crowd went absolutely crazy. But poor Dad! He came back with the ice cream having missed it all. As the innings wore on, your three year-old attention span started to wane and you became antsy in your seat. At one point you were sitting on Dad's lap having a laugh with him when I captured this image with my camera phone. I love this photo because you can see how happy Dad is being at a Yankees game with his son. He often tells me that despite growing up in New York, his father never took him to a Yankees game when he was a young boy. Because of this, he made a promise that if he ever had a son he would take him to Yankee Stadium in the summer to watch baseball and eat hot dogs and ice-cream. Even though around the 6th inning you were a complete goof-off and the Twins blew out the Yankees after getting six runs in the 9th inning, Dad was just happy to be with you at the game on such a beautiful day. I have no doubt there will be many more Yankees games for the two of you in the future, and most likely your little brother too. But this was the first. I mean, how cool is that?! We left just before the ninth inning was over to beat the crowd and took the D train home. For you, taking the subway to the stadium and back were the bookend highlights to a wonderful day with your Dad. I was so grateful to be able to spend the afternoon with you both, sharing in the "firstness" of it, and of course, to take photos that we can look back on as time passes. I love you son, my little Bronx Bomber, always & forever.